London Art News previews art exhibitions in London and reports on anything of special interest in the visual arts worldwide, from ice sculpture to body painting. Here's news for my one Canadian reader. (If there are more of you, own up.) CyberMuse "Your Art Education Research Site" brings to the Internet Canadian Painting in the Thirties, a worthy online rehash of the 1975 exhibition driven across country by the National Gallery of Canada. The bad news is that this new website crawls like a dying tortoise, due to loading megabytes of Flash Player 9 nonsense (safe, but boring). Why do they do it? The good news is that the site is also in no-Flash HTML. Guess which I chose. 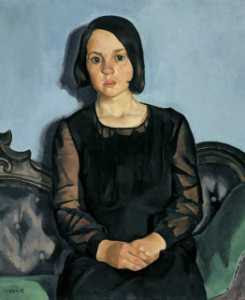 And look what I found: Edwin Holgate's portrait of Ludivine (1930). This pretty teenager in her party frock is the most pensive sitter I've ever seen. "Oh dear, I wish Mummy hadn't left. I know he paints nudes. What should I say if he asks me to undress? Oh dear, oh dear...." A great portrait. Thank you for visiting London Art News. Enter your email to receive free updates.